Recently, during an exceedingly difficult afternoon, a stranger kindly asked me if I needed anything. A glass of water, perhaps? I hadn’t realized I was thirsty, but he had. He saw the need for water—and the need for encouragement—and provided both. 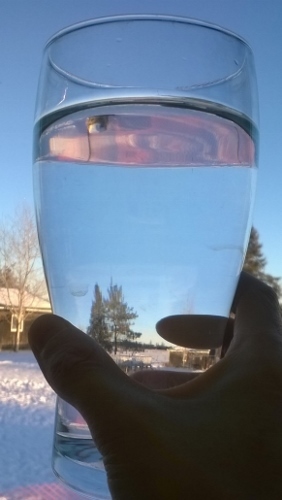 Just a simple glass of water. Just an encouraging, compassionate smile. But it added a bit of comfort to a background of horror. May God bless this stranger. And I Get to Share That! Posted in: Devotional, Life, Simple Joys. A good reminder to look for small ways to bring comfort to others when able. I hope all is well. Dank je wel. Dit is mooi geschreven en een bruikbare les. God voorziet. In comfort. In mensen om ons heen, al kennen we hen niet eens soms. En wij hebben in Zijn Naam ook iets te bieden aan de mensen om ons heen. Thank you, Jennifer. Things are well now, praise be to God.